China’s top Islamic leaders urged the nation’s Muslims to resist religious extremism and oppose to terrorism after a number of violent attacks in the Xinjiang Uygur autonomous region in March and April. Around 80 religious leaders and scholars discussed Islamic doctrine by quoting the Quran and the teachings of the Prophet Muhammad on Wednesday and Thursday in Urumqi, the region’s capital. On Thursday, Islamic leaders in China passed a proposal calling on all Muslims in the country to regulate their behavior, resist religious extremism and improve their moral outlook. Abulitif Abdureyim, director of the Xinjiang Islamic Association, said governments at all levels in the region are resisiting religious extremism. “The attackers who carried out the terrorist activities cannot go to heaven because they have violated the sayings in the Quran,” he said. Wang Yujie, a professor of religious studies at Renmin University of China, said separatist forces are the main source of terrorism in Xinjiang. In recent years, China has seen a number of violent attacks on police, government organs and civilians. 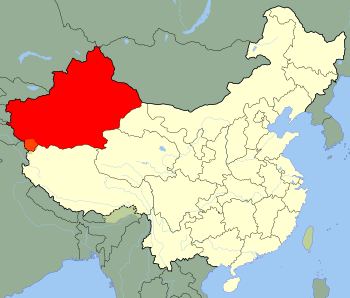 Most of the attacks have taken place in Xinjiang. A national security blue paper said on May 6 that religious extremism was the major reason for 10 violent terrorist attacks last year. via Islamic leaders join efforts against extremism – China – Chinadaily.com.cn. China is to “declare war” on pollution, Premier Li Keqiang said on Wednesday at the opening of the annual meeting of parliament, with the government unveiling detailed measures to tackle what has become a hot-button social issue. It is not uncommon for air pollution in parts of China to breach levels considered by some experts to be hazardous. That has drawn much public ire and is a worry for the government, which fears any discontent that might compromise stability. “We will resolutely declare war against pollution as we declared war against poverty,” Li told the almost 3,000 delegates to the country’s largely rubber-stamp legislature in a wide-ranging address carried live on state television. Curbing pollution has become a key part of efforts to upgrade the economy, shift the focus away from heavy industry and tackle the perennial problem of overcapacity, with Li describing smog as “nature’s red-light warning against inefficient and blind development”. “This is an acknowledgement at the highest level that there is a crisis,” said Craig Hart, expert on Chinese environmental policy and associate professor at China’s Renmin University. China has published a series of policies and plans aimed at addressing environmental problems but it has long struggled to bring big polluting industries and growth-obsessed local governments to heel. Li said efforts would focus first on reducing hazardous particulate matter known as PM 2.5 and PM 10 and would also be aimed at eliminating outdated energy producers and industrial plants, the source of much air pollution. China will cut outdated steel production capacity by a total of 27 million tonnes this year, slash cement production by 42 million tonnes, and also shut down 50,000 small coal-fired furnaces across the country, Li said. The 27 million tonnes of steel, equivalent to Italy’s production capacity, amounts to less than 2.5 percent of China’s total, and industry officials have warned that plants with another 30 million tonnes of annual output went into construction last year. The targeted cement closures amount to less than 2 percent of last year’s total production. The battle against pollution will also be waged via reforms in energy pricing to boost non-fossil fuel power. Li promised change in “the way energy is consumed and produced” through the development of nuclear and renewables, the deployment of smart power transmission grids, and the promotion of green and low-carbon technology. The National Development and Reform Commission (NDRC), the country’s economic planner, said in its report that new guidelines would be issued on relocating key industries away from urban centers to help tackle smog. via China to ‘declare war’ on pollution, premier says | Reuters. For Li Zongyi, 77, an unexpected visitor to her home has realized her decades-long dream. The guest was Premier Li Keqiang. During a one-day trip to Tianjin on Friday, he paid a surprising visit to Li Zongyi\’s home in the Xiyuzhuang community, one of the oldest shantytowns in the city, and promised residents that they will be able to move into new apartments in the next year. Like families in the Xiyuzhuang community, hundreds of millions of residents in shantytowns nationwide are expected to move into new apartments, analysts said, as the country pushes ahead with renovation projects for these areas. Huang Xiaohu, a researcher at a consultancy center affiliated to the Ministry of Land and Resources, said the renovation of some shanty areas can be very difficult, due to the complexity of the local population, a lack of financial support, and disagreements among residents on the relocation plan. The Xiyuzhuang community, covering 64 hectares and with low-income residents comprising 20 percent of its households, is a typical case, Huang said, as the cost of compensation is too high. \”The only way out in this case is to let the government play the dominant role and provide residents with low-cost houses, instead of costly commercial apartments,\” he said. A State Council meeting in June pledged to improve housing conditions for the underprivileged and to promote urbanization by accelerating shantytown reform. Urbanization will also be pushed for another 100 million people living in the country\’s less developed western areas. To achieve the target, the government will encourage private capital and enterprises to invest in the shantytown transformation, and will allow local authorities to use corporate bonds to solve the financing problem. As of 2013, China has solved the housing problems of 2.18 million households living in shantytown areas and embarked on projects that could solve such problems for another 3.23 million households, 6 percent higher than planned. Tao Ran, a professor at Renmin University of China, said the government has looked to the resettlement of residents in shanty areas to be one of its key economic drives in coming years. But some fundamental work should be addressed before any steps are taken, he said. Tao suggested that a universal guideline be introduced for local governments to follow during demolition of homes to avoid misconduct and conflicts. via Li drops in to help realize home dream|Politics|chinadaily.com.cn. Ten teams of inspectors sent around the nation four months ago as part of the leadership’s anti-graft drive have wrapped up their field trips, finding “corruption problems” in most places they visited. They inspected units in Chongqing, Inner Mongolia, Jiangxi, Hubei and Guizhou, as well as the Ministry of Water Resources, the Import-Export Bank of China, the China Grain Reserves Corporation, Renmin University and the China Publishing Group. The teams have provided feedback to the inspected bodies and alerted the Central Commission for Discipline Inspection (CCDI) to signs of possible corruption, according to a statement released on the official website run jointly by the CCDI and the Ministry of Supervision. The central inspection teams aim to spot corruption and create an atmosphere of “shock and awe” [among officials] to curb rampant corruption, said Wang Qishan, China’s anticorruption tsar, before despatching the teams in mid-May. The most eye-catching destination was Chongqing, still smarting from the upheavals of the downfall of its former party chief Bo Xilai . Bo was sentenced to life imprisonment for corruption and abuse of power. In a comment about the new Chongqing municipal government, Xu Guangchun, head of the Fifth Central Inspection Team, said the municipality had failed to impose sufficient checks and supervision over its top leaders, and certain leading cadres did not have firm political beliefs and failed to reach moral standards. Xu also warned about “corruption risks” in state-owned enterprises in the municipality, pointing to rampant “fly-style” corruption – committed by lower-ranking officials – within the organisations. via Chinese inspectors uncover widespread corruption in “shock and awe” probe | South China Morning Post. Given that it was Chairman Mao who said that “women hold up half the sky”, it is surprising that women still do not feel equal in China. But history and culture is obviously very deep rooted. NY Times: “If you want to Lean In in Chinese, you “Take One Step Forward.” That’s how the title of Sheryl Sandberg’s contemporary feminist manifesto, “Lean In: Women, Work and the Will to Lead,” has been translated here. And you do it with gusto, judging from the reactions of about a thousand students and businesspeople at two events in Beijing last week where Ms. Sandberg, the chief operating officer of Facebook, promoted the new Chinese version of her book. “People were hungry for it,” Allison Ye, co-founder of a “Lean In circle” in Beijing — a small group of peers who meet to talk about the book’s message — said of the response to Ms. Sandberg’s main point: overcome your internal barriers to success and get to the deal table. The enthusiasm suggests an intriguing possibility: As the Chinese government strikes anew against freedom of speech, detaining even mild-mannered democracy activists, civil society advocates and popular public opinion leaders, might there be a feminist revolution in China before there is a democratic one? In recent weeks, Lean In circles have set up in half a dozen universities in the capital, including Tsinghua University, Peking University and the Communication University of China, members said in interviews. Of course, feminism in China predates Ms. Sandberg’s book. But it has gained new focus with the arrival of the movement here. Ms. Ye’s conversion began in March, when she chanced online upon a TED talk given by Ms. Sandberg in 2010 called “Why we have too few women leaders.” She was hooked. “I was shaken,” she said. “I said to myself, ‘Who is she?’ Everything she said was, wow! So true. I watched it three times in one day. Then I bought an English copy of her book. Many young Chinese women, especially in cities, are highly educated and beginning to overtake men in some college subjects — Ms. Huang said there were 16 women and 7 men in her finance class — but deep cultural messages hold them back. Either way, experienced Chinese feminists have welcomed it. “I think her message is definitely an empowering one, calling for more women to get to the deal table,” said Feng Yuan, an activist for gender rights and equality. Still, it is only one response to the daunting cultural and institutional hurdles facing women in China, Ms. Feng said. It may not work for uneducated, poor or rural women, Ms. Feng said, an echo of criticism that the book has received in the West. “Her target audience is educated and ambitious women, and these women are able to mobilize resources to achieve their goals,” she said. via For China, a New Kind of Feminism – NYTimes.com.